Is it too early for rumors about the Samsung Galaxy S10? Of course not, and a new report out of South Korea suggests we can look forward to an in-display fingerprint sensor, advanced face recognition, and a choice of two screen sizes when the handset arrives sometime next year. 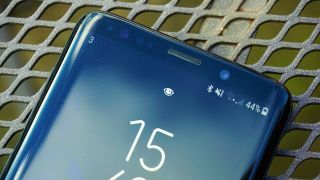 Along the way the iris scanning tech of the current Galaxy phones is getting ditched, according to sources speaking to The Bell. Samsung will instead go all-in with fingerprints and a 3D face scanner similar to the one Apple has on the iPhone X. We're still months away from a Galaxy S10 reveal though, so don't take all of this as set in stone just yet. We know that Samsung has been working on this kind of biometric tech for a while now, and if it can't get the sensors working well enough in time, it may revert back to a more conventional approach to phone unlocking. As for those two display sizes, they've apparently been set at 5.8 inches and 6.3 inches for the Galaxy S10 and the Galaxy S10 Plus respectively. The Galaxy S9 display measures 5.8 inches corner to corner, while the Galaxy S9 Plus version measures 6.2 inches. No doubt the bezels will get shrunk even further too. It's still early days in the rumor cycle for the handset, but we've seen a handful of leaks drip out onto the web already. One of those suggests there's going to be a triple-lens camera around the back of the new phones, as Samsung catches up to Huawei. In the meantime we're all waiting for official news on the Galaxy Note 9, which should be unveiled by Samsung within the next couple of months. The phone should give us plenty of clues about what to expect from the Galaxy S10, though at the moment we're not expecting Samsung to include an in-display fingerprint sensor on the Note.